If you have blue eyes, we can offer you the most advanced UV or IR contact lenses. We are keeping pace with the over-changing technology. So far, we have developed successfully three types of poker cheating cards reader of different qualities. ① The latest and the newest poker cheating lens for blue eyes. With the sophisticated sandwich technology and the technology of laser dyeing, this type of contact lenses has been on market. The biggest breakthrough of this type of lenses is that they will not change the color of your eyes under any circumstance. Besides, the lenses have no side effect on your eyes. Lastly, the marked cards juice on the back of the card decks are easy and clear to be detected by your super luminous contact lenses. The price of this kind of lens may be a bit expensive, but it will worth a try! ② The second type of the juice cards contact lenses for blue eyes are of average quality. This type of lens may not change the color of your eyes, but it may change the original color of your pupils according to different lights. Compared with the newest ones, these lenses are lower in price and still excellent in effect and reliable in quality. This type is the most favorable one among the users. 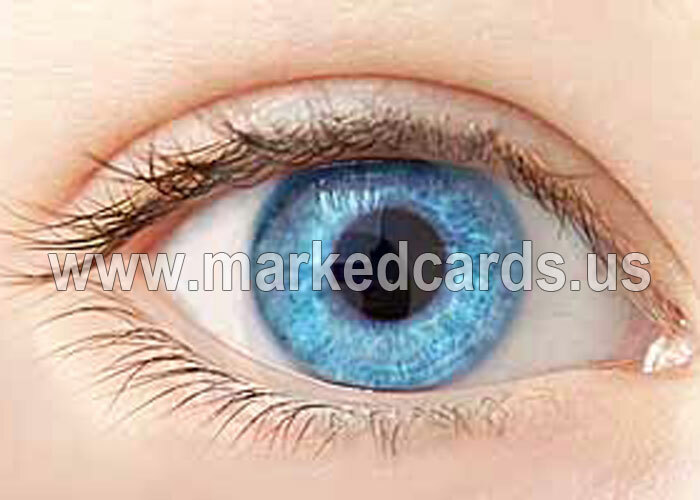 ③ The third type of marked cards contact lenses for blue eyes is also on sale. Unlike the first and the second type, this kind of lenses will change the original color of your eyes. But you may have no difficulty in spotting the marks on the back of the marked cards. This type of lens costs least of all.